Southeastern Measurement and Controls Company was founded in 1986 to serve as a local sales representative for original equipment manufacturers (OEMs). 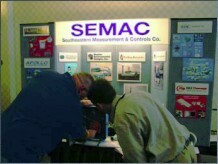 In 1995, the company was incorporated as SEMAC. We now market a variety of products having application in industrial processes, commercial facilities, and utility systems. Our customers include manufacturing plants, natural gas utilities, water/sewer utilities, government agencies, research firms, fire departments, and construction contractors. Since our founding, SEMAC has supplied equipment for transporting, storing, cleaning, heating, and controlling gases and liquids. Many of the valves, pipe fittings, pressure vessels, and other processing equipment we sell are used at compressor stations, measurement and regulation (M&R) stations, and points of delivery in the transportation of natural gas. These items are also used in the industrial processing of other compressed gases such as air, nitrogen, and hydrogen. Our manufacturers of process equipment are generally small to midsize businesses capable of designing and fabricating pressure rated vessels and other devices customized to end user specifications. We also offer complementary products for use by operations and construction personnel to maintain, install, and control this equipment. These include instruments and other hand tools such as grease guns, plastic pipe squeeze-off presses, gas detectors, confined space gas safety monitors, data loggers, thermal imaging cameras, and laser alignment kits. Photovoltaic modules, inverters, batteries, and accessories are available for assembling off-grid stand alone power systems. Product knowledge is our specialty. Call us for assistance in determining whether the equipment and materials we supply can help you accomplish your job. © Copyright 2015 SEMAC, Inc.